We offer quality repair and competitive prices for all of your exhaust system and muffler repair needs. Make sure to stop by our 268 State Street location for an inspection, as a damaged exhaust can hurt both your car and the environment. When you need brake repair, brake pad replacement, or even a total brake job, our local Augusta, ME Meineke is there to help you with everything you need to drive (and stop) safely. 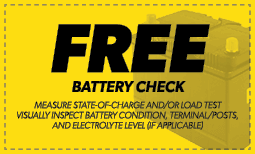 Keep doing what you are doing because it works, that is why I continue to go back and recommend Meineke. I always have my oil changed at the Meineke in Augusta Maine. The guys behind the counter are very friendly and knowledgeable and the service is faster than most. I tell people that I meet that they are a reliable shop. Very friendly and always keep me updated on the status of the repair.